Disability, understood as culturally stigmatized bodily difference (including physical and mental impairments of all kinds), is a pervasive and permanent aspect of the human condition. While the biology of bodily difference is the proper study for science and medicine, the meaning that we attach to bodily difference is the proper study of humanists. The interdisciplinary field of Disability Studies has recently emerged to theorize social and cultural constructions of the meaning of disability. Although there has been an astonishing outpouring of humanistic work in Disability Studies in the past ten years, there has been virtually no echo in musicology or music theory. 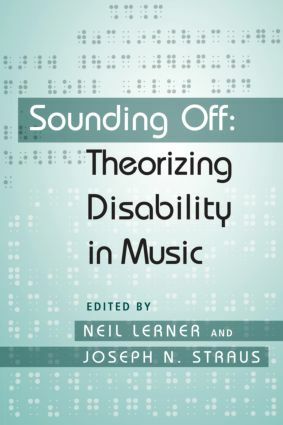 Sounding Off: Theorizing Disability in Music is the first book-length work to focus on the historical and theoretical issues of music as it relates to disability. It shows that music, like literature and the other arts, simultaneously reflects and constructs cultural attitudes toward disability. Sounding Off: Theorizing Disability in Music promises to be a landmark study for scholars and students of music, disability, and culture.